I went into Eating Animals expecting to have a punch thrown at me, and the book definitely accomplished that. Like most people, I was aware that there is a lot wrong with the factory farming industry, but I hadn't looked into it much. I'd watched a few documentaries (like "Food, Inc.") and learned a bit about it in college (we had a speaker come once and show a lot of horrifying pictures), but those didn't change the way I ate. Enter this book. 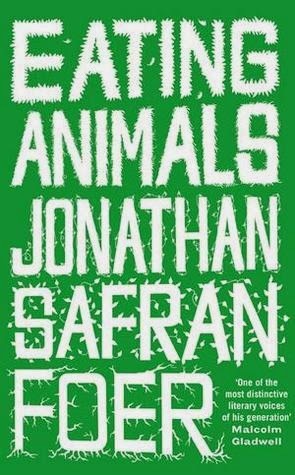 I love Jonathan Safran Foer's fiction, first of all, so I was excited to read a nonfiction book by him about a subject I felt I should learn more about. And as I expected, I really liked the way he handled the subject. He mentions a lot of facts and studies and books, but he also takes the time to visit farms himself. Many of the farms he visits are ones in which the farmers have made a big effort to treat the animals kindly (until they kill them, of course). I also really liked that Foer had different people involved in his research write their own sections. From what I remember, there is one written by a girl who saves animals from farms, one written by a guy with the most "ethical" turkey farm in the US, and one written by a man who used to work at a pig farm. It was helpful to hear their voices as well. As you might have suspected, a big hunk of this book is going to make you very sad if you care about animals at all. The treatment of animals in factory farms is just abhorrent. I hated reading about the cruelty, but of course I didn't want to turn away from it either. Although the focus is the treatment of animals at factory farms, Foer also talks a lot about how eating animals can be bad for your health and why factory farms are bad for the environment. The only thing I didn't like about this book was the very beginning. The long introduction felt unnecessary and not particularly interesting. I just wanted to get to the facts. Although I did like learning about Foer's personal history with eating animals, I would recommend that other readers just skim through the first section. I recommend this book to anyone and everyone, but be prepared for some shocking and sickening truths. VERDICT: 4/5 stars. Sad, shocking, interesting, and effective.